Production I.G. 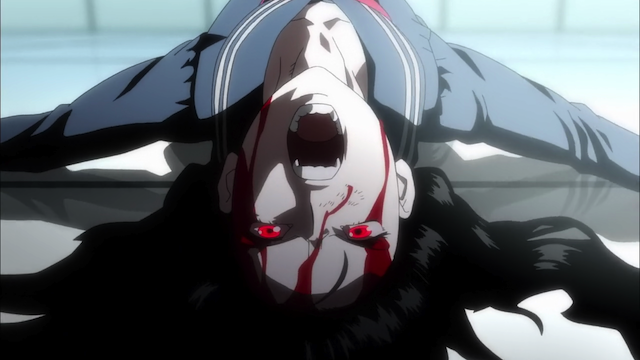 did an amazing job with the animation in Blood-C ~ the last dark. The first thing I wanted to comment on was that the animation was superb. 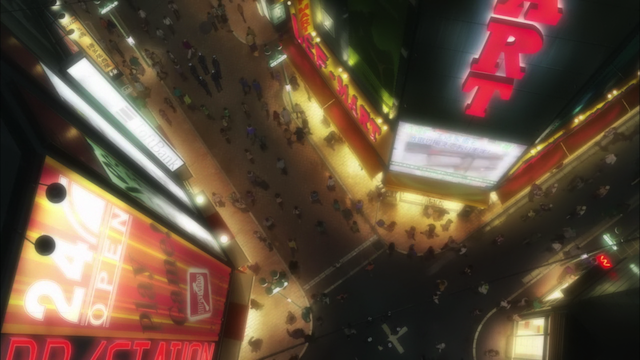 Scenes like the one looking down on the crowd shown above were fully animated, which is highly unusual, because animating the complex motion of lots of individuals is notoriously time-consuming (read “costly”). There were very detailed animations of coffee pouring, and a very impressive car chase. Obviously it is tough to convey the effectiveness of animation in a still shot, so you will either have to take my word for it, or watch the movie yourself. 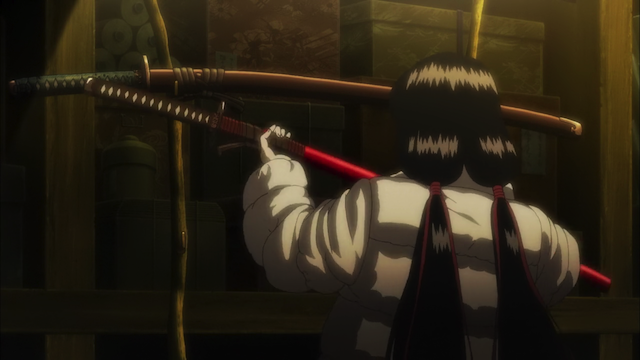 Saya picks out a new katana: Another scene in which the lighting and textures and animation all came together perfectly. 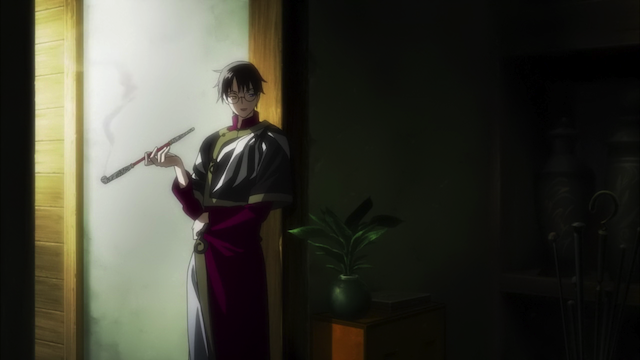 Kumihiro Watanuki smokes a pipe: They’re not even trying to be subtle about it anymore. One of the points in Blood-C that caused some outrage while the shows was airing was the way CLAMP … well, was CLAMP. They managed to tie the Blood universe to their own CLAMP-verse via the trans-dimensional shop that Watanuki manages in xxxHolic. In the TV series it was just strongly implied, but “the last dark” owns it. And truth be told: the shop looked great! There were other places where CLAMP-isms came through, such as in occasional places where characters had elongated bodies. I was never bothered by these things. I don’t have any problems with CLAMP having a distinctive style, or imagining all of their stories somehow share a universe. Saya continues to fight against the “old gods”. I’m very happy that Blood-C ~ the last dark lived up to my expectations. I enjoyed the TV series and thought the movie was even better. In fact the movie was one of the best animated features I have seen out of Production I.G. in a while. Very much looking forward to this, have had it downloaded for a month now still not found time to watch it grr… Glad it’s good though, just know I’ll enjoy it as well.